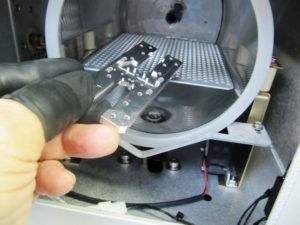 Using an oxygen plasma to detect sulphur contamination | The Glow Research AutoGlow plasma cleaning system was used with an oxygen plasma to detect surface contamination from a silver plating vendor. Using Plasma to detect sulphur contamination using the AutoGlow plasma cleaning system. 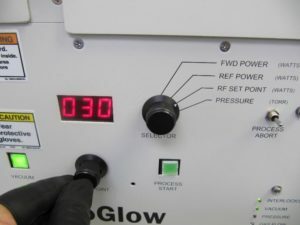 Customer input: The Glow Research AutoGlow plasma cleaning system was used with an oxygen plasma to detect surface contamination from a silver plating vendor. Sulphur dioxide temporarily reduces oxygen on the silver plated surface and becomes colorless. With the introduction of Oxygen Plasma sulphur contamination becomes visible. Subjected silver plated trays to Oxygen Plasma. 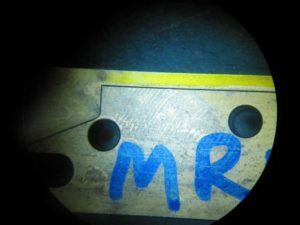 The objective was to explore the contamination that has caused the resistive RF ground being reported by our Production Tune & Test. Sodium Bicarbonate (NaHCo3) abrasive cleaning on the coupon pockets where die coupons are placed resulted in acceptable overall performance versus the blind test of units that were not abraded. Clearly, the silver plated metal is exhibiting material that is resistive from the plating vendor. Oxygen plasma is typically used to remove carbon based contaminants on surfaces. The method to determine whether cleaning process is performing is by contact water angle. 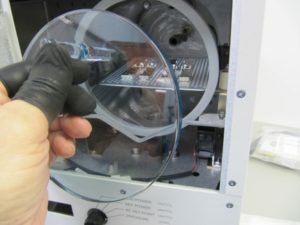 When the contaminant is removed, the contact angle is reduced. Placed both silver plated trays into Plasma Cleaner. 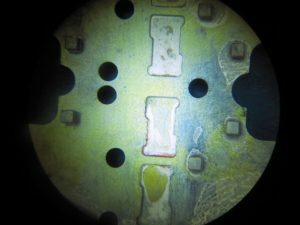 Solder Mask residue (silicone dioxide) does not react to Oxygen plasma. Note reaction of carbon based finger print to Oxygen plasma. Initial RF set point was “zero’d” out and dialed to 30 Watts after the Pressure was at or below 0.5 Torr per instruction manual. Forward Power was measured at 29 Watts and Reference Power was at 30 watts. Oxygen flow meter at 3.5 with 10 PSIG pressure to system. The etching exposed non-uniform sulfur deposition silver beneath the top layers. The concentration of total sulfur on the plated surface decreased with aqueous wash, which was explained by the accumulation of sulfur on the surface of the samples. A decrease of the sulfur concentration is detected after prolonged plasma treatment times (over a minute) was observed and was attributed to the aqueous wash and sodium bicarbonate scrub. The results of this DOE indicate the possibility of a wash treatment to remove a large concentration of sulfur that is used in the brightening of the silver plating. Would like to thank Art Nakamoto for his contribution for this good work. Art Nakamoto is known in the Failure Analysis MIL-STD-1580 MIL-STD-883 Method 5009 DPA community, microelectronics processing and the microwave packaging community. Questions regarding this application can be either forwarded to his Linkedin contact : artnakamoto or artnakamoto@gmail.com. Art would like to recognize his mentors. Ralph Redemske, Michael Barnowski, Amnon Yariv, Kam Lau, Henry Blauvelt, James Hall and Israel Uri.